Show No. 22 takes place tonight! so my wife and son were supposed to be back in Albany last night at 9 and we were all going to drive down to Philly this morning...well after a couple of mishaps planewise - they missed their connection and couldn't fly in until today from Denver. I try not to think this may be my last chance to see Brian and Roger...but it creeps up now and then! Wow, your family has found a way to make lemonade out of lemons! Congratulations and I hope you have a great time in Philly tonight! You've earned it! I'll be at the gig tonight too. In Brooklyn, it was my best friend and I. But tonight my parents, wife, and aunt and uncle are coming with me. I've been looking forward to this gig in particular for the pure reason I'll be sharing it with family. But the seats aren't going to be as close. In Brooklyn, I was five rows back on stage left (in front of Brian's mic). Tonight I'll be somewhere looking down at the side of the stage on stage right (not nose bleeds, still close enough, I'm sure). I wonder if Frank's entrance will be as effective from that angle. I certainly worry about that. And by the way, I forked over $210 on merchandise in Brooklyn. I'm such a sucker! It will be a whole different view! I was on stage right just below the club suites and was able to see robot Frank when he first arrived as well as the whole guitar-shaped stage and the gorgeous designs that the lasers made on the back wall of the arena! I think this is one of their greatest stage designs. I loved the look on my friend when Frank punched through the metal plating. It was beyond epic. soxtalon wrote: so my wife and son were supposed to be back in Albany last night at 9 and we were all going to drive down to Philly this morning...well after a couple of mishaps planewise - they missed their connection and couldn't fly in until today from Denver. Lover Boy wrote: I'll be at the gig tonight too. In Brooklyn, it was my best friend and I. But tonight my parents, wife, and aunt and uncle are coming with me. I've been looking forward to this gig in particular for the pure reason I'll be sharing it with family. But the seats aren't going to be as close. In Brooklyn, I was five rows back on stage left (in front of Brian's mic). Tonight I'll be somewhere looking down at the side of the stage on stage right (not nose bleeds, still close enough, I'm sure). I wonder if Frank's entrance will be as effective from that angle. I certainly worry about that. I hope you all enjoy the show too! Soxtalon, can you give your thoughts about the show when you can? THANKS Philadelphia !!! This is what you guys looked like tonight - from my backstage steps -… "
"Had an amazing time seeing @QueenWillRock with @adamlambert tonight. They put on a fantastic show." 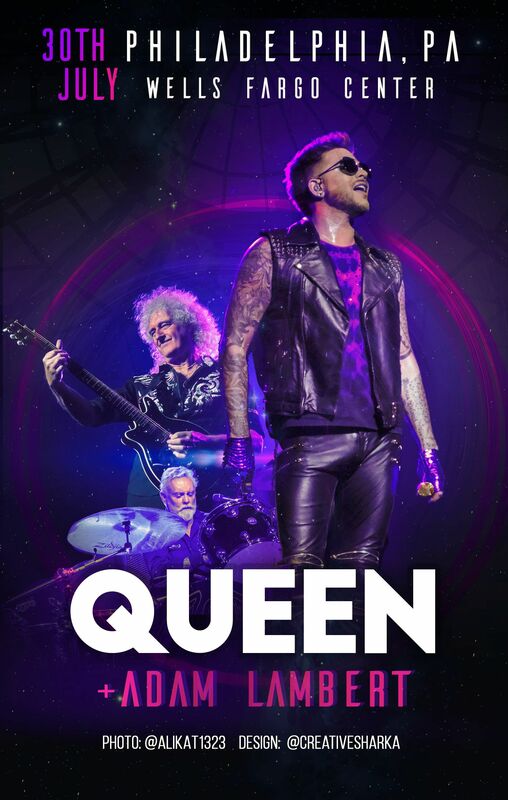 "Penultimate concert for the UK Queen crowd in Philly. Nearly time to start the countdown to Europe. #QALPhilly #qal2017 #adamlambert"